Pontypool has developed something of a reputation for being an “intellectual” horror film. Whether used as a compliment or pejorative, that assessment is entirely deserved. This is a film that has a lot on its mind—and ironically, ends up having a lot to do with the idea that maybe not having anything on your mind is vitally important. 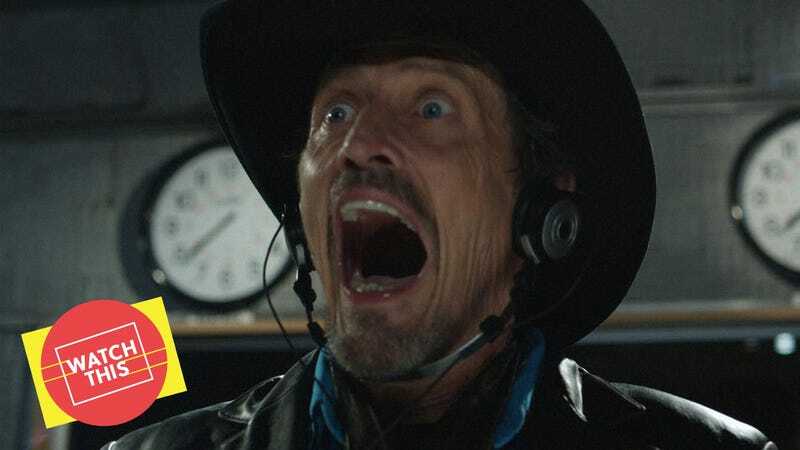 Essentially a film-length bottle episode, Pontypool follows a morning radio DJ named Grant Mazzy (veteran character actor Stephen McHattie, in the role he was born to play) as he begins his normal day at a new gig in the small Canadian town of Pontypool. We get little hints that this is a demotion—Mazzy was fired from his previous DJ job, and according to him, it was because of his provocateur, shock-jock commitment to speaking truth to complacency. He starts drinking the moment he enters his booth, and with help from his technical assistant Laurel-Ann (Georgina Reilly) and producer Sydney (Lisa Houle), begins the routine—sometimes playful, occasionally combative, but always striving to make great radio. The day’s work gets disrupted, however, when they get a strange report regarding a riot outside a doctor’s office in town. The people are saying strange things, chanting, spouting gibberish. It turns violent. From there, the situation spirals out of control. To say much more would be to spoil its twist on a classic horror trope, but part of the wicked fun of Pontypool—and what makes it surprisingly unsettling, lingering in the mind long after the bizarre final shot—is how seriously it treats language. Specifically, the English language, in all of its awkward complexity. The characters all speak in distinctive ways, and the little flourishes or tweaks of their verbiage reveal personality quirks or character traits otherwise hidden. The film shows us how words do more than simply make meaning—they convey a host of other qualities that vary among people, and can take on strange or even contradictory definitions. Once it is clear what’s causing people to behave in odd and violent ways, the movie gets even more intriguing and open-ended, not less. The “answer” is little more than a gateway to further questions, a means of refuting the usual A-to-B horror tactic of mystery followed by resolution, or at least explanation. And that, unsurprisingly, means there’s a vast range of interpretations of what Pontypool has on its mind. Capitalism, ideology, romance, language, emotion itself—there’s a whole host of ways that viewers could read the events of this film, and the movie remains ambiguous enough to make a pretty good case for most of them. By turning a visual medium to focus on radio—a purely auditory medium—it also interrogates how we listen to the things we see. Radio plays out in our mind, whereas film does it in front of our eyes, but the disjunction there gets a full workout in Pontypool, complete with a Roland Barthes quote for good measure. Availability: Pontypool is available to rent or buy through the major digital services. It can also be obtained on DVD or Blu-ray from Netflix, Amazon, or possibly your local video store/library.